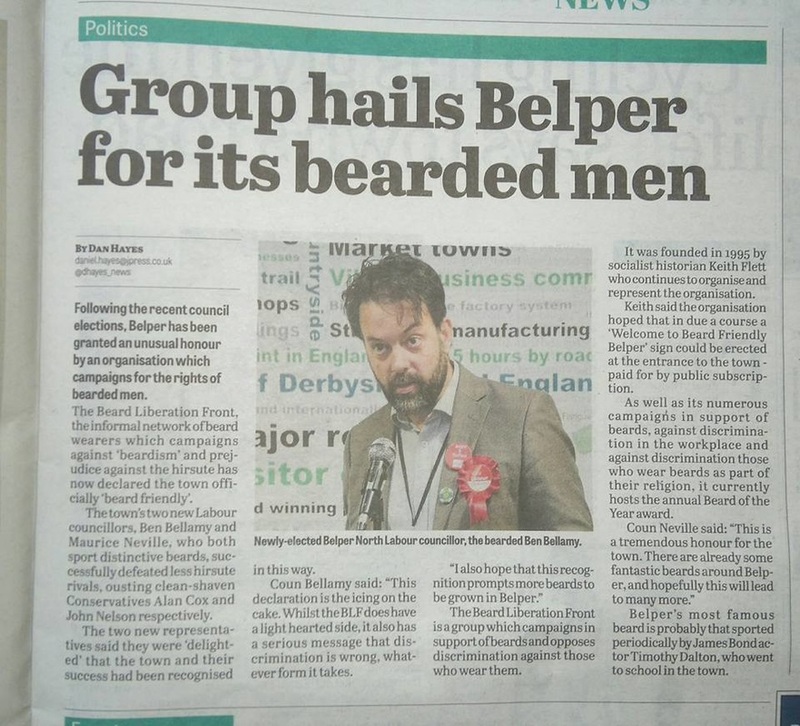 A Labour controlled Town Council will be committed to being very active and open in making Belper an even more brilliant place to live, work and visit. 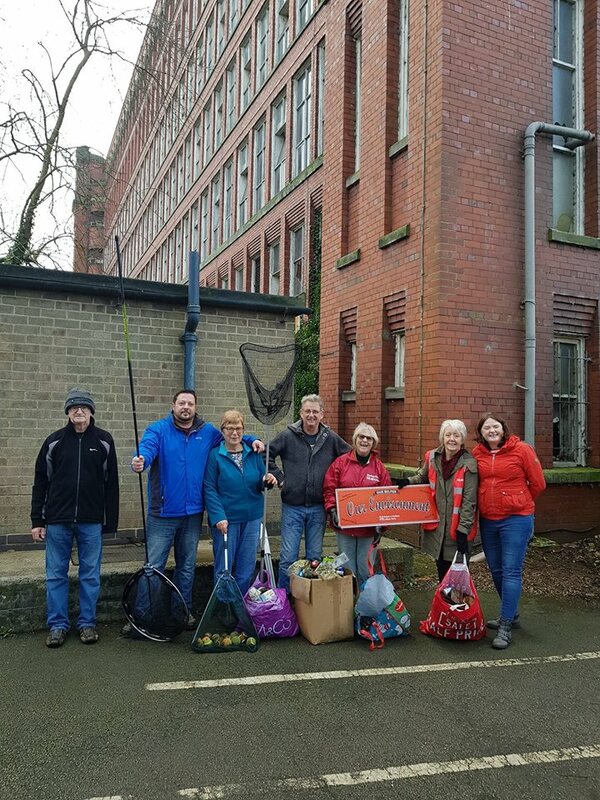 We will concentrate on themes we know Belper cares about: Environment; Children and Young People; Town Centre, Business and the Local Economy; Heritage and Tourism, and The Arts - which will impact on all parts of our community. More effective partnership working with councils and other partners will be an essential way of achieving our aims – including, where appropriate, grants to community groups, to assist in the vital services and opportunities they offer residents, young or old. In this manifesto you can read about our plans. We will work on this priority with local groups like the Belper Neighbourhood Plan team, Transition Belper, Belper Against Plastics and Accessible Belper. Initially we are focusing on three key issues that affect Belper and the surrounding areas; Air Pollution, Recycling and Health and Well Being. Air pollution hotspots have been identified in a recent traffic survey in our area. Work with Amber Valley Council to reinstate dog wardens. 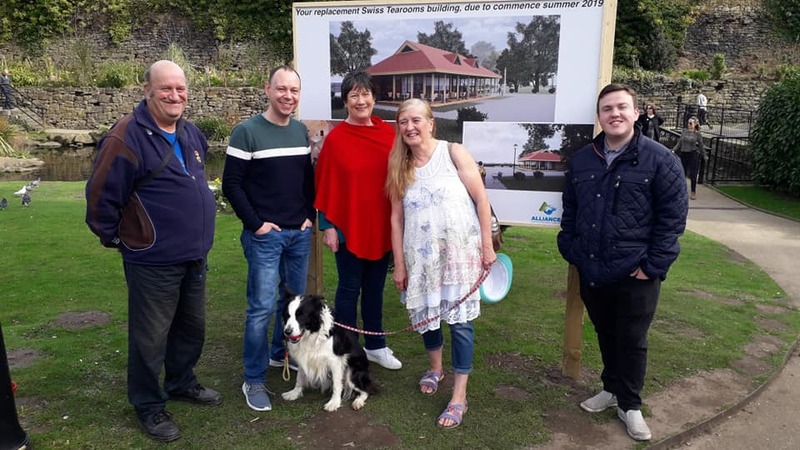 Labour Councillors have initiated a new community group to implement improvement projects which are fully accessible, environmental and inclusive for the parks and open play spaces in Belper and Milford. A Labour Town Council will work with this group to secure grant funding. Encourage children’s participation with arts organisations and holiday play schemes. Belper is great town with huge potential: independent shops, strong arts and crafts, great places to eat and a range of commercial businesses give the town a unique character. Our historic industrial heritage, our location in Derbyshire and strong community feel make the town a great place to enjoy, live and do business. A thriving town centre and the adjoining streets are vital to our economy and Belper must be a welcoming destination. We need to appeal to both residents and visitors. A Labour Town Council will ensure our Town Centre is accessible to all and the diversity of our events, visitor attractions, shops, cafes, restaurants and bars are known near and far. Create a Town Centre and Heritage post to market the Best of Belper and work with the retailers and others to ensure Belper and Milford benefit from tourism and inward investment. Ensure our pavements are wheelchair and buggy friendly. Increase the seating in King Street with support from Amber Valley. Our North and East Mills and River Gardens are the core of historic Belper. Strengthening our tourist offer will also help local business. Continue to help fund the costs of Belper North Mill Museum and Visitors Centre. Labour’s 7 women candidates for the Town Council, all have had lead roles in forming our Town Manifesto. Experts in their own right from the Environment & Climate Change, Belper’s Neighbourhood Plan, promoting play space for children & young people, supporting the Arts in Belper & focusing on a thriving Town Centre with modern facilities. Labour women leading the way. Belper Labour Campaigners were out in force this morning in King Street for our regular street stall. 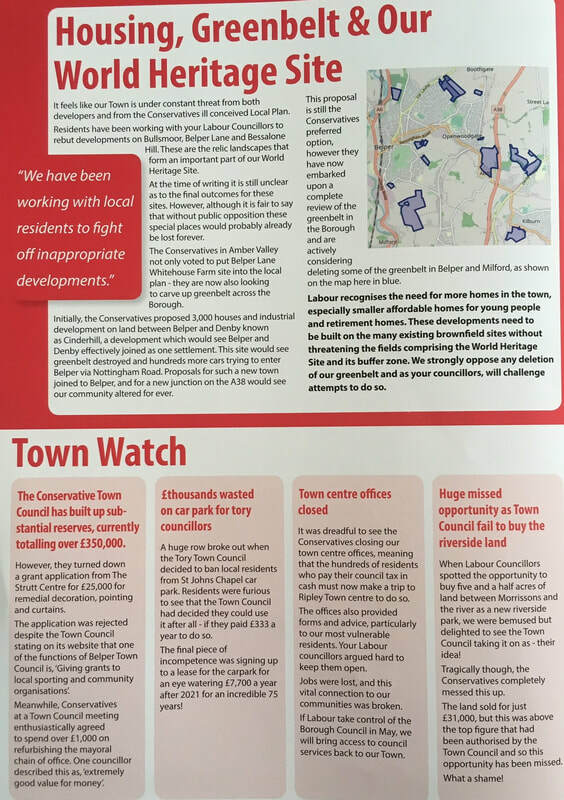 Our local candidates and sitting councillors spoke to many members of the public about the threat caused by the Conservative Borough Council decision to remove part of Far Laund and 13 other sites from the Green Belt - hundreds of leaflets about this were taken by concerned residents. Vote Labour on 2nd May - for councillors who will fight for our Green Belt. 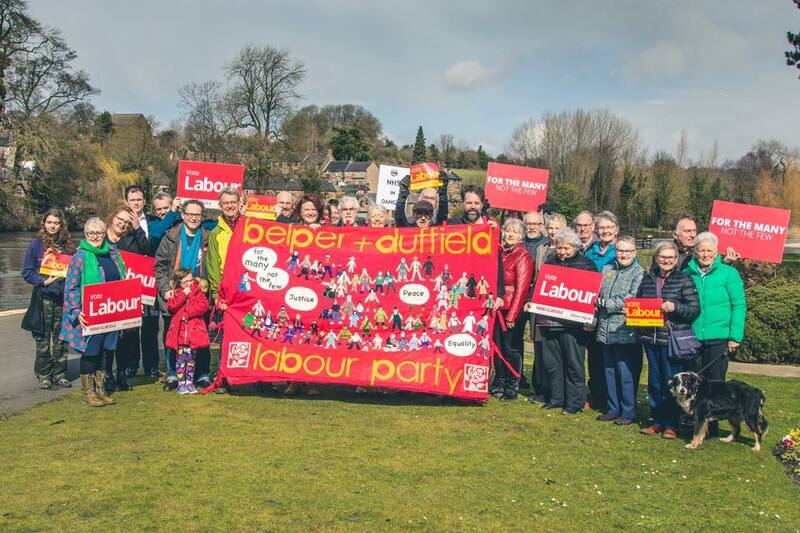 Candidates and supporters gathered in the Belper River Gardens on Sunday to celebrate Labour's campaign to win the Town and Borough Elections on May 2nd. Labour is contesting all 16 Town and 4 Borough Council seats in the town. ​Green Belt Policy was established in 1955 primarily to stop urban sprawl and to permanently protect belts of open land. to assist in urban regeneration, by encouraging the recycling of derelict and other urban land The Green Belt is positive planning, and protects countryside which is nearby for 30 million people. The protection gives us 29,000 kilometres of public rights of way, woodlands and nature reserves. Green Belt land is a scarce resource and it is afforded protection by the National Planning Policy Framework –Chapter 13. Two thirds of all green belt land is in agricultural use, and this is a vital economic resource for food security and soil protection. 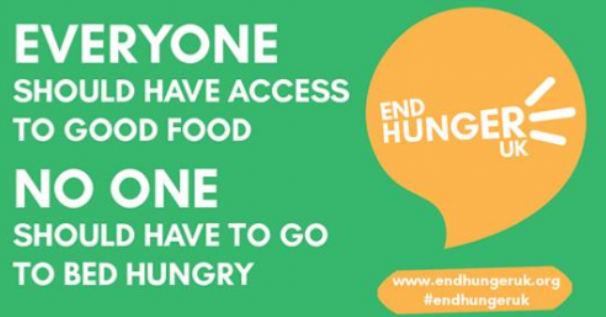 This has to be of high environmental value when global population growth and climate change are putting increasing pressure on land, at a time when we grow less than two thirds of our own food. Now more than ever we need to avoid unnecessarily losing our countryside. The solution is the redevelopment of brownfield sites, which should have greater focus in decision making. The Campaign to Protect Rural England reports that there are enough brownfield sites to accommodate at least 1 million homes. Amber Valley Borough Council has not completed a brownfield survey which should have been the first step. A core planning principle is to ‘encourage the effective use of land by reusing land that has previously been developed. Most of this land is in urban areas close to jobs, roads and amenities. The revised National Planning Policy Framework states that the exceptional circumstances needed to change Green Belt boundaries can only arise once Councils have considered all other options, including using brownfield sites, these considerations have not happened. I specifically want to talk about the recommendation to delete land from the Green Belt on Far Laund in Belper, which is in my ward, Belper East. 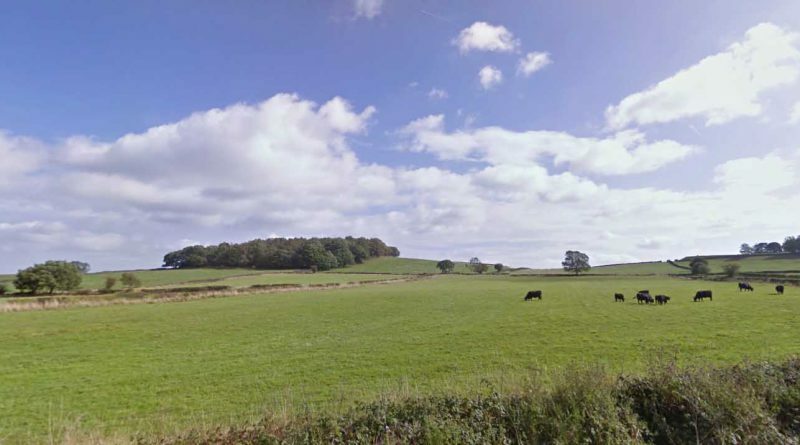 The proposal would result in unrestricted development in the open countryside and would undoubtedly narrow the gap between Belper and Heage which both have individual and special characters. This site is currently in agricultural use. The suggestion that the site is readily accessible to local services is farcical. It is half a mile to the nearest shop, a mile to the nearest secondary school and one and a half miles to medical centres, dentists etc. 345 houses on this site where it is so far from services would have a considerable impact on traffic issues. The site includes Coppice Brook, which rises in Ripley, flowing under the A38 highway into the Far Laund area of Belper, and then to the Parks. The brook originates from spring water and surface rain water, the underlying rock being millstone grit. The water flows out of the Parks and follows a course along the back of Brookside before entering culverts under the main Derby to Sheffield railway line and the A6 roadway, before emptying into the River Derwent. This brook should be protected and enhanced through active management rather than built around. It is an amazing natural brook where water voles have been recorded recently, and there are also records of sticklebacks further upstream. The site also has numerous footpaths crossing through, which are regularly used, and connects Far Laund with Whitemoor. The Green Belt is our countryside next door, its fresh air and open spaces make it fundamental to our physical health and mental well being. Swallowing up farm land and wildlife habitats increases pollution, flood risk and car dependency. I voted in Full Council on 4th March, against the proposed amendments to the existing Green Belt boundary to delete any land from the Green Belt, as did all my Labour colleagues. We are now in a six week consultation period regarding the Local Plan. It is crucial that everyone who wants to protect our Green Belt, uses this opportunity to object. The proposed changes to the Submission Local Plan have been published for public consultation until 4:30pm on Tuesday 30 April 2019. You can find all of the documents on the AVBC website. So I have just returned from the open greenbelt drop in, in Belper, to look at the consultation documents. I was there for the whole event from 4pm to 7pm - talking to residents about how to object and discussing the other options. Not one single Conservative councillor or candidate turned up to explain why they have put these vandalistic plans forward, and instead they left it to officers to explain their decisions. Shameful. We get lovely photos of a new tea room before every election - but no tea rooms. The bumbling conservatives haven't yet even put planning application for this latest one. ​But the new photo is useful, as is shows three of the Belper Tories who have voted to destroy our Greenbelt. Protect the Greenbelt???? 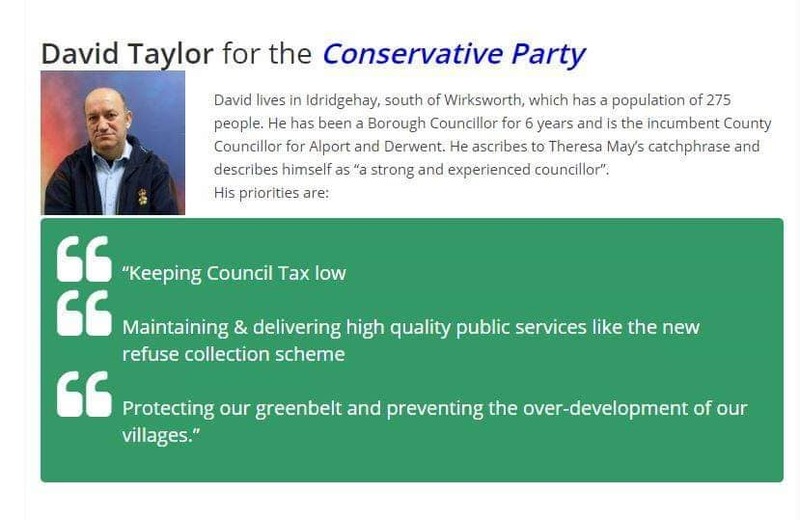 Not only is the promise to do so on the local Conservative website, but is also on Cllr Taylors leaflets for the NEXT election! Yet they just voted to do EXACTLY the OPPOSITE, and delete Greenbelt for housing. Appalling. It is this sort of duplicity that gives all politicians a bad name. When I was elected I vowed to call out hypocrisy, and I will continue to do so, even from my hospital bed, however much they lie or shout me down. Cllr Valerie Taylor - from IDRIDGEHEY!!! 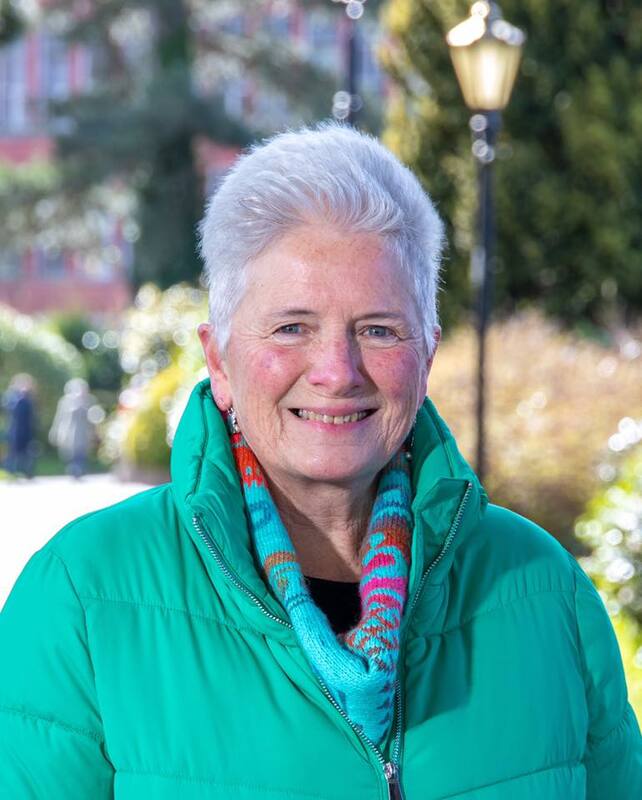 Deselected by the Tories from her current Heage ward, Cllr Taylor along with her borough and county Cllr Husband, David Taylor - BOTH VOTED FOR GREENBELT HOUSING ON FAR LAUND, IN EAST Ward, and 13 other sites!! 22 Tory Amber Valley Cllrs, including all four Tory councillors from Belper, just voted in favour of deleting part of the Green Belt at Far Laund and 13 other sites from around the Borough, including Duffield. They won the motion by just one vote. All the Labour councillors, including all four Labour cllrs from Belper, and two Tories voted against and one Tory abstained. Now we are in a battle to stop this going any further. What a pity the 22 Tory councillors who voted for Green Belt deletions, including all four Tory Cllrs in Belper ( Dan Booth, Jo Booth, Jackie Cox and Paul Hillier) weren't listening. 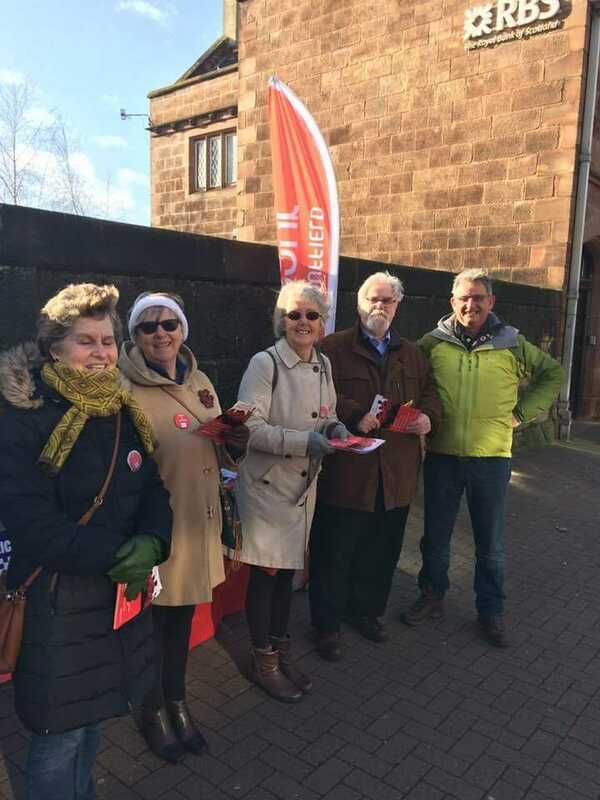 Our Labour Team out in King Street earlier this month talking to people about the cuts in the police budgets. The Tory controlled Amber Valley Borough council are consulting Derbyshire County Council on deleting huge swathes of Greenbelt around Belper for development! You will not believe the size of some of the sites under consideration. Disgraceful to even consider carving up our Greenbelt for ever, for developers easy profit. A big thank you to these lovely people for joining us for our weir clean this morning. The government has just lost a vote in the House of Commons again - for the third day in a row - this time a vote on betting, in Committee rather than in the Commons chamber. Not a single Tory voted to support the government. How long will this 'zombie government' drag itself on? ​The required future savings that Derbyshire councils say they need to make total nearly £100 million. 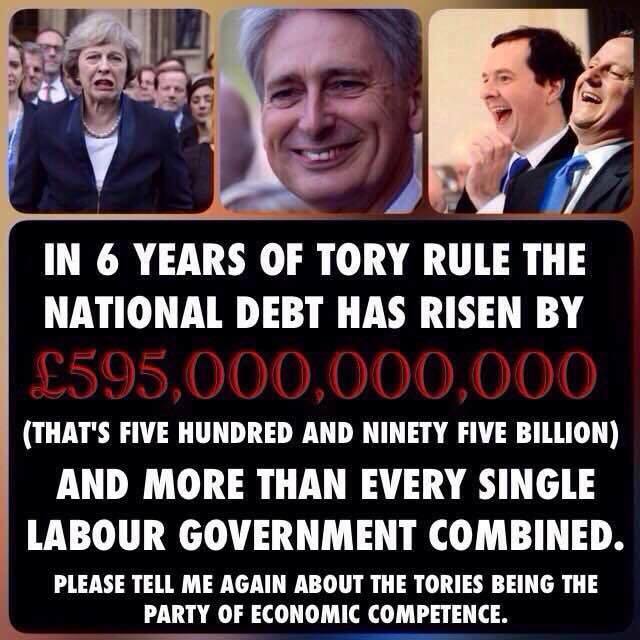 This is despite the UK’s Chancellor of the Exchequer stating that the “era of austerity is finally coming to an end”. The reductions in public funding aimed at reducing the nation’s budget deficit have been dubbed “austerity” by opponents. 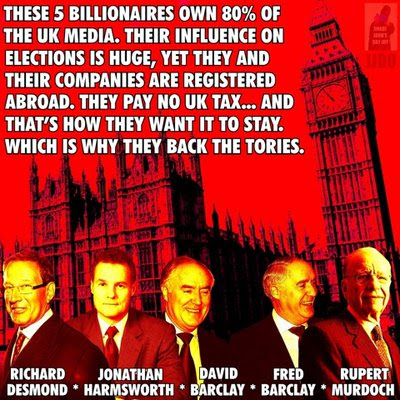 They were started in 2010 by the coalition government and Prime Minister David Cameron. At the start of the year, Derbyshire County Council had put forward plans to cut £53 million from its budget by 2022. In September, this had shot up to £70 million, taking the total the authority says it will have saved between the start of austerity and 2022 to £327 million. Its total budget for the current year was £503.2 million. Earlier this month, High Peak MP Ruth George queried Government claims that there had been “real-term” increases in council budgets. He said that investment was being made to “create a sustainable position for local government”. A spokesperson for the department said it was working with local authorities to “develop a funding system for the future based on the needs of different areas”. The county council is proposing funding cuts of £18.5 million next year in its steps towards the £70 million savings. The authority’s director of finance, Peter Handford, stated that the council “continues to face significant cost pressures”. In July, he emphasised the need for the authority to keep on top its savings targets, to avoid worsening its financial situation. He said: “We face a tough balance as an authority of resources versus our revenue budget. Meanwhile, in Derby, the city council is aiming to make £12 million in savings next year with £22.84 million to find up to 2022. Deputy leader, Conservative Cllr Matthew Holmes said that “many of the decisions that we are going to make will not be easy” and called it an “extremely challenging situation”. Derby’s budget this year is £217.8 million. Both authorities have pledged to lobby central government for more funding for adult and children’s social care – with the two authorities proposing further council tax increases next year to ease budget pressures. Meanwhile, at Derbyshire Dales District Council, a spokesperson says that the authority’s spending power has been reduced by £287,000 since last year. It is predicting a further reduction of £350,000 next year, and savings have been allocated to cover that. Going forward, until 2020, the authority must find a further £800,000 in savings. Its total budget this year is £35.8 million. At Amber Valley Borough Council, a spokesperson says that the authority has been affected by the removal of the Revenue Support Grant from central government. This will see £3.6 million cut over the course of 2017 to 2020. The authority has already achieved half of this saving, £1.8 million, and must now find an additional £1.8 million. Its total budget this year is £52.1 million. 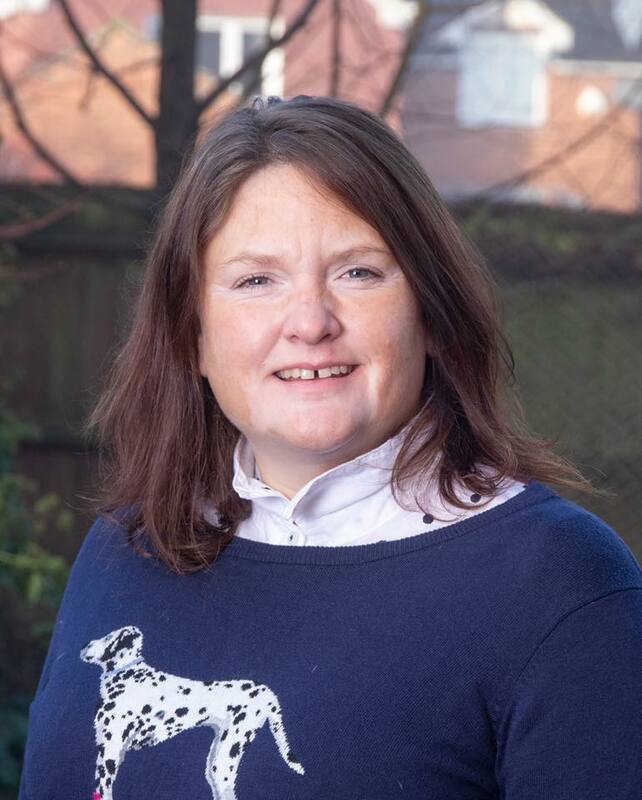 At Erewash Borough Council, the authority made £700,000 of savings this year, and is looking to make £2.7 million over the years 2019 to 2021. At least £1.2 million of these cuts are likely to be made next year, with the remaining funding reductions yet to be determined. Its total budget this year is £50.8 million. Over at South Derbyshire District Council, the authority is looking to cater for its future funding deficits by pulling from its reserves – which are at “healthy” level. It is forecasting a deficit of £723,481 for next year, with a total cumulative shortfall of £1.3 million predicted up to 2023. This will have dramatic impact on the level of its general reserve, which would fall from £9 million this year, to £7.5 million next year, and to £2.2 million in 2023. However, this remains above the minimum level of £1.5 million. This strategy has been judged to be “high risk” by the council’s director of finance and corporate services, Kevin Stackhouse, who wrote: “The deficits in future years were projected to be significant. The authority had a surplus of £778,399 this year. Mr Stackhouse says that the current forecast is a “worst case scenario” and will be subject to many changes over the next few years, due to the Brexit fallout and general changes in government funding policy. He says that the funding position is updated throughout the year and the authority is always looking to plan at least two full years ahead, removing the need for any quick money-saving decisions. Mr Stackhouse says that the council’s revenue is set to grow as a result of new housing in the district. The council’s total budget this year is £45 million. A Ministry of Housing, Communities and Local Government spokesperson said: “Councils in Derbyshire will have access to over £1.4 billion this year and next which they should use to meet the needs of their residents. “We are investing in Britain’s future, and at budget we announced more than £1 billion in extra funding for local government to address pressures on services. They voted AGAINST a Committee recommendation for all parts of the council to do Health Impact Assessments on policies. This is at a time when the life expectancy gap between wards in our borough is huge and also AGAINST working much more closely with the County Council and local NHS to improve health and life expectancy. 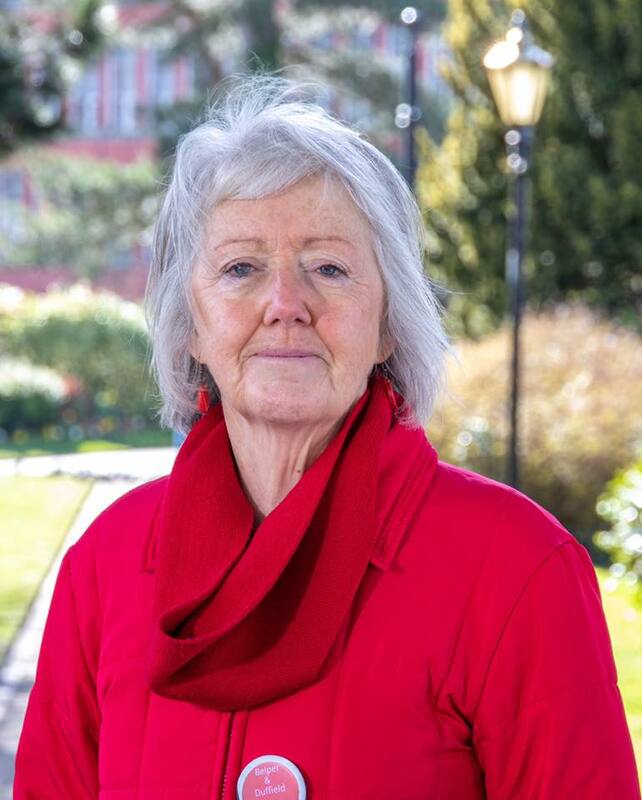 Cllr Atkinson proposed writing to the Secretary of State for education to reverse cuts to our schools since 2008. The Conservatives didn't want to be seen to vote against - so they moved an amendment to refer the matter to the county council instead. But seven of them are county councillors - so they all know that the county has already voted NOT to write to the secretary of state for education. Democracy needs to be respected - Council Meetings are scheduled months in advance and should happen as planned, not cancelled at the whim of the Council Leadership. Sign this petition to help those suffering under Universal Credit and all the vicious cuts to benefits. ​The Tory Leader of Derbyshire County Council Barry Lewis has been having a cosy meeting behind closed doors with the Tory leaders of Leicestershire, Nottinghamshire and Lincolnshire to discuss abolishing district and borough councils across the region - “We’ve written to the new Secretary of State asking to meet and talk to him about our East Midlands plans.” boasted the Leicestershire CC leader. What do our Tory cllrs in Amber Valley, Belper and Duffield think about this cunning plan? Will they tell us ? Some photos from today’s visit from Jeremy Corbyns visit to Amber Valley. Walk about in Belper with the Police & Crime Commissioner and officers. 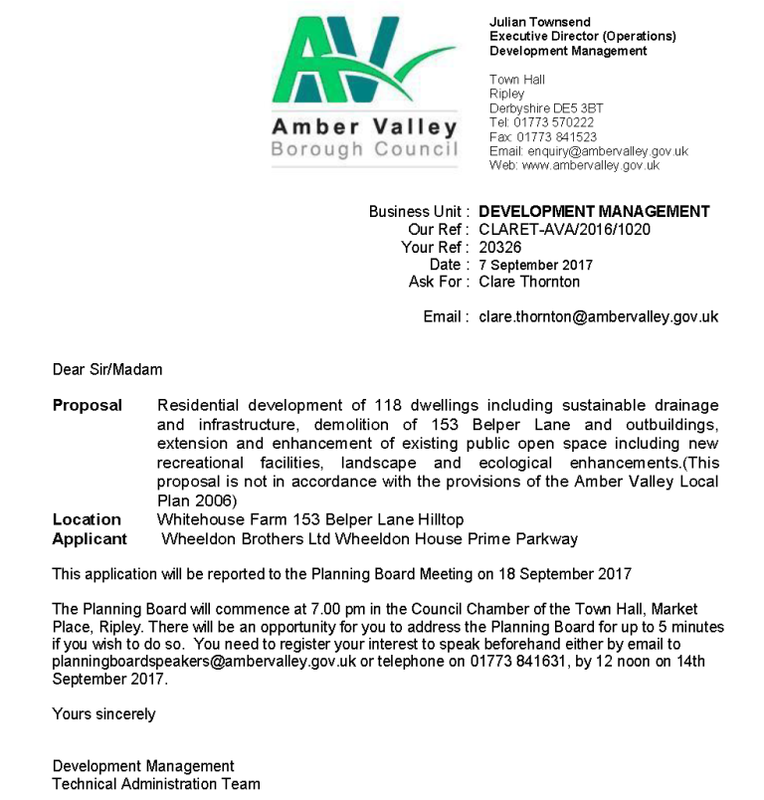 I have today written to Julian Townsend, Executive Director of Amber Valley, requesting that due to errors and misrepresentations in the Planning officers report, that the Belper Lane application should be refered back to the planning board for reconsideration, before the decision letter is issued. I don't need to go through the issues with the report here - suffice to say that members of this group and myself have been uncomfortable with a considerable number of aspects. Please bear with me - I am doing all I can to try and stop this dreadful vandalism of our world Heritage site. BABINGTON HOSPITAL CLOSURE. 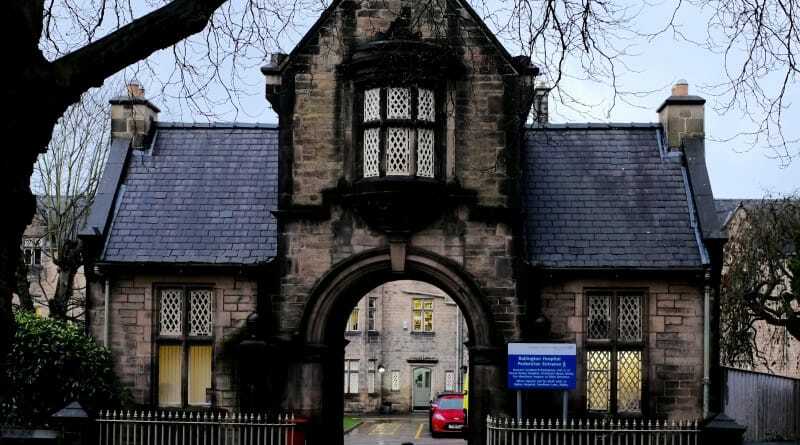 Last night at Strutts Centre the Belper NHS/SOS campaign hosted a meeting about the proposed closure of Babington Hospital, loss of all overnight beds and transfer of other services to a new site in Derwent Street. The site will be sold off, removing yet more public land from our Belper heritage. 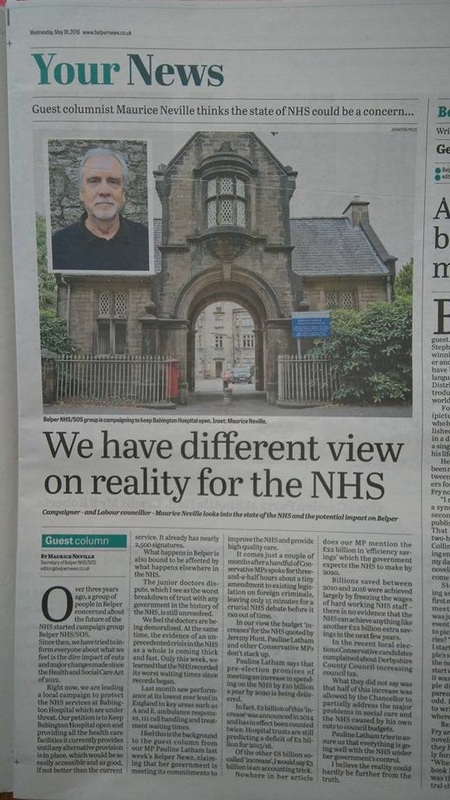 The NHS management in Derbyshire told us that there is going to be NO formal public consultation about this because they have already decided the issue. This will be challenged. Go to this link to make your feelings known and watch out for details of more public meetings. A DATE FOR YOUR DIARY 3rd FEB - LONDON DEMO FOR THE NHS. 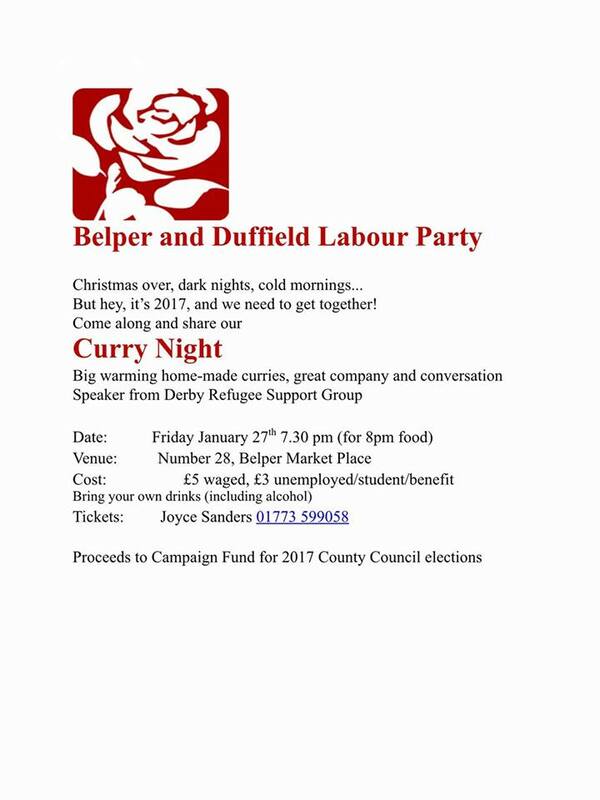 PEOPLE FROM BELPER WILL BE GOING. MORE INFO TO COME. ​NEW REPORT REVEALS DERBYSHIRE COUNTY COUNCIL INVESTING £257 MILLION IN CLIMATE-WRECKING COMPANIES WHEN IT SHOULD BE INVESTED IN RENEWABLE ENERGY OR OTHER SUSTAINABLE ACTIVITY. National data released today has revealed that Derbyshire County Council is investing £257 million in the fossil fuel industry through their management of the council pension fund . “Divest Derbyshire” campaigners  say the controversial investments threaten the climate and also represent an unacceptable financial risk to pension-holders. The amount directly invested in the fossil fuel industry includes £143 million (55%) in companies with major fracking operations . The release of the ‘Fuelling the Fire’ report and data coincides with UN international climate talks taking place in Bonn, Germany, which the UK government is attending. It highlights the incompatibility of the UK’s climate action promises with continued investment in the fossil fuel industry. “" I think it's high time the Pension Fund explain to their members why they are continuing to invest in an industry that is financially risky and morally bankrupt when we want our pension fund invested in more forward thinking and sustainable industries"
"Scientific opinion suggests that we have probably already lost the chance of limiting the global temperature rise to the 1.5 C. agreed at the Paris Climate summit. It is now extremely urgent that we stop using fossil fuels NOW". “With hurricanes devastating the Caribbean, wildfires ravaging southern Europe and flooding and drought destroying lives across the world - the impacts of climate change are hitting hard. “Despite this, UK councils are still ploughing billions into companies like Exxon, Shell and BP who have spent decades fuelling the crisis, and profiting on its back. The data and online map released by 350.org, Platform and Friends of the Earth ranks councils by their fossil fuel investments, and allows residents to see every company or fund their local council has invested in. The figures show that UK councils invest a total £16.1 billion of their workers’ pensions into companies that extract coal, oil and gas, fuelling dangerous climate change. This is out of a total of £289.9 billion. Full divestment commitments have so far been made by two UK council pension funds, with a further four making partial commitments . The campaign to divest local council pensions has this year received backing from Unison and the Trades Union Congress (TUC) . Belper Lane turned down. Massive thanks to the 153 people who turned up to support us. Belper Lane site is being recommended for approval, and the application will be heard on the 18th September at Ripley at 7pm.My request to have the meeting moved to Belper has been refused. PLEASE ATTEND THE MEETING and HAVE YOUR SAY, or join a protest against the plan outside of the building from 6pm. It was insanely wreckless of the Conservatives, including Belper cllrs J Booth, D Booth, J Cox, P Hillier and M Tomlinson to vote to have Belper Lane in the local plan. The developer can point to the fact that the site is in the draft plan, to support his application. If this application does go ahead, then our world heritage status and the economic prosperity of our town will be in jeopardy. 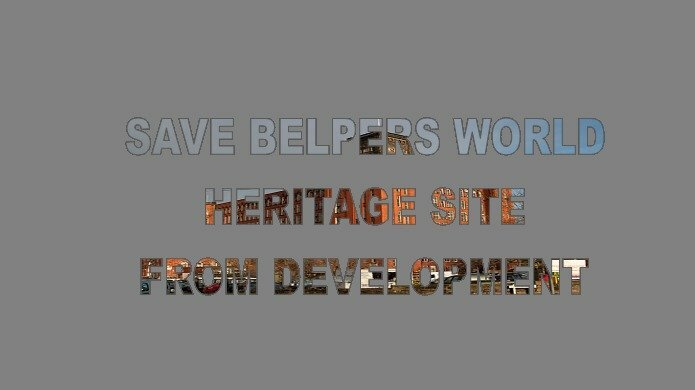 Losing our world heritage status would open all sites around Belper up to developers, including Bullsmore again, and Bessalone hill. It would decimate our emerging tourist industry, that we so badly need to thrive following the factory closures of recent years. 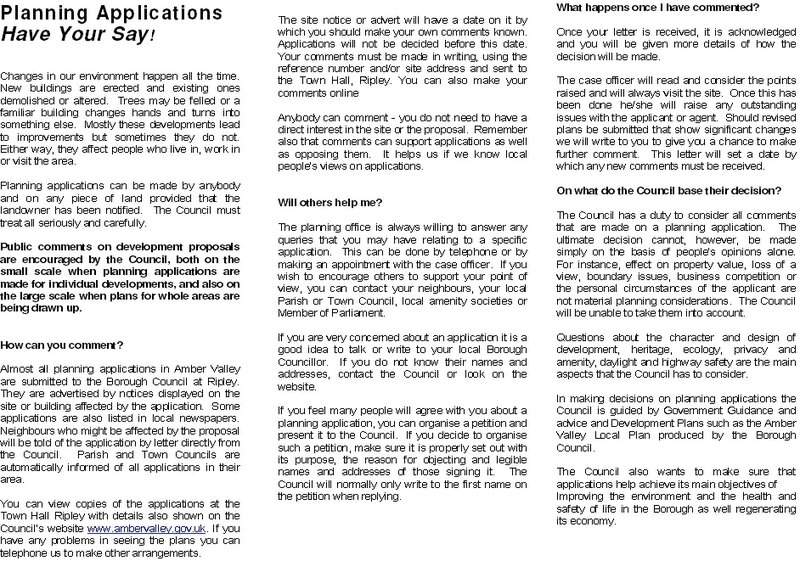 The Planning Board will commence at 7.00 pm in the Council Chamber of the Town Hall, Market Place, Ripley. There will be an opportunity for you to address the Planning Board for up to 5 minutes if you wish to do so. You need to register your interest to speak beforehand either by email to planningboardspeakers@ambervalley.gov.uk or telephone on 01773 841631, by 12 noon on 14th September 2017. Amber Valley Borough Council has been criticised by a government housing inspector as making an ‘unreasonable’ decision - and he has awarded costs against the council in favour of a local campaign group. The Council refused to back their own planning board and did not defend an appeal against the decision to not allow 200 homes on contaminated land at Somercotes. The 200 homes formed a significant element of the number of houses required by the Local Plan, and together with the judgement preventing homes being built at Kedleston Rd, there now appears to be an unsustainable shortfall. Other sites earmarked in the Local Plan include the World Heritage Buffer site at Belper Lane, but bizarrely not the former ABRU site in Belper which has just had planning agreed. The public consultation is set to be examined by the councils Scrutiny committee after Labour Councillors complained that the results were withheld from councillors until after the decision on the draft local plan was made. (Minus The Four Months Without A Full Council Meeting). After the dreadful fire in London, Royal Borough of Kensington and Chelsea recently came in for much criticism, including from the government, for avoiding public scrutiny and cancelling a meeting. What then of Amber Valley Borough Council? – Surely our local council, of which I am a member of the opposition group, would not want to avoid scrutiny? No? Well actually I am afraid it is a yes. Please note that the Full Council meeting scheduled for 12 July 2017 has been cancelled. The next Full Council meeting is scheduled for Wednesday, 20 September 2017. So with the last meeting being held in May, there will now be a period of 4 months – a 3rd of the year, with no Full Council meeting – and hence no chance for councillors to ask questions of the leader, pose motions to the council or indeed for members of the public to address the council. And they are still continuing to hold Cabinet meetings at 10.30 am rather than evenings, with very little public attending. Last week’s cabinet had only 4 people the previous only 1 member of the public. So the question to ask here, of course, is why? Why would the council, led by Conservative Cllr Kevin Buttery, not want to hold any meetings between May and September? I am informed by the leader of the Labour group that (he was told) the decision was taken not to hold a meeting, as they considered that there was not enough business to discuss. Let’s think about what members of the public, or indeed Councillors may have wanted to raise. Well I am sure the local plan would have featured heavily. Firstly, there is the fact that the public consultation on the local plan was not published nor made available to councillors until AFTER the decision on the local plan was made. I may have moved a motion to revisit the decision on the allocations to the local plan, in view of the now available public consultation. Secondly, the high court decision to block the building of housing on Kedleston Road should also have been discussed. I would have expected the leader of the council to have made at the very least a statement on how this may or may not affect the local plan, and what other implications the decision may have for the Borough – and to have been open to questions on this from Councillors. Belper residents may have wanted to know what is happening with the land off Field Lane in Belper, on which £1.6 million was spent (for the leisure centre that never was..) – Cllr Dan Booth famously announced that everything that the Borough owns is for sale – and the councils own papers confirm that the officers of the council are charged with the disposal of the land. We may have expected a progress report from the council leader – how is it being marketed, what use would the council expect of desire to be made of the land? Perhaps the public may have wanted to raise in public speaking grass cutting; the state of some playgrounds; housing issues; the state of our cemeteries; or the little matter of the risk to the World Heritage Site being put into ‘at risk status’ bought about by the local plan allocations. It may well be because the finances are in a complete mess (they are). After wasting the money on Field Lane and £1million plus on local plan, and the implications of accepting the council tax freeze grant, it is not a surprise – but the public wants to hear what is going to be done about it. Currently the council seem to be relying on the new homes bonus to keep going – this is a sum equal to council tax on all new homes granted planning permission, for a period of 6 years. The incentive is to approve planning permission for big housing estates. Is this sustainable? In May I completed my first year as a Councillor. It has been gratifying to be able to help dozens of individuals with their issues, from planning problems to anti-social behaviour, and it has been great to work with the community to oppose local inappropriate developments. However, watching the business of the council has been depressing. We have seen CCTV camera switched off (swiftly followed by a horrendous bladed weapon incident in the town); we have witnessed the closure of our town centre offices against overwhelming public opinion; we have seen a Local Plan bought forward at huge expense with no public consultation being taken notice off – with green belt, contaminated land and World Heritage Site Buffer allocations against all expert opinion – a Local Plan that seems again doomed to failure. I have raised questions and placed motions to try and save the CCTV, World Heritage site and Town centre offices, and also to get the funding for the Tea Rooms in the River Gardens (by selling the aforementioned Field Lane Land). But the reality of being in opposition is that the Conservative group invariably voted on block to prevent any of these motions succeeding. I am also proud to have publicly raised the issue of the three local Conservative associations taking £5000 donations from local developers – not illegal, but something the public should be aware of. Outside of Amber Valley control we now have the Babington Hospital set to close, with many services looking like they will be sent to Ripley and Ashbourne. That is another fight we will have locally. It does seem, that in my first year as Councillor, that all the ruling group in Amber Valley have overseen is things being turned off, closed down or broken. “The Queen’s Speech appears to show a government in denial about the major risks facing patients, their families and carers. While the media is awash with reports of plans to withdraw services and treatments to cope with funding shortfalls, there is no commitment by the Government to address the funding crisis. After three years of hard work we have finally been able to start on the new exciting care home and library for Belper. ​Plans to build a new care home, library and other facilities on the site of the former Thorntons factory in Belper have been given the go-ahead. 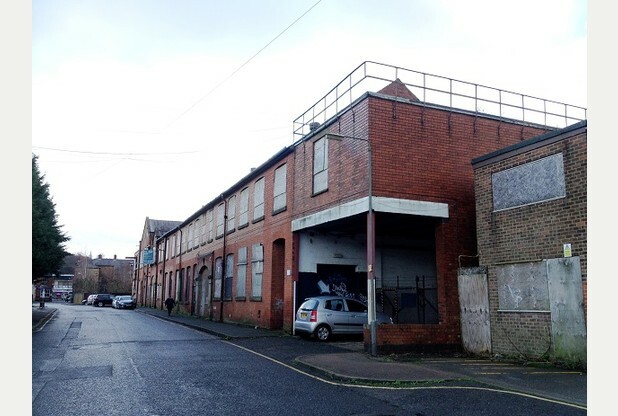 Derbyshire County Council has been given permission to knock down factory buildings in Derwent Street and build the integrated care centre with 40 private rooms, as well as a public library and cafe/restaurant which will serve both residents and the wider community. In the UK 158,000 families own 41 million acres of land, while 24 million families live on the four million acres of the urban plot. No other country in Europe, apart from Spain, has such an unequal concentration of land ownership. All the freehold property in Hong Kong is owned by the state except for the cathedral. The government sells relatively short leaseholds with high ground rent. Hong Kong is a shining example of the superiority of Land Value Tax. It used to be Labour Party policy to nationalise land ownership. The Labour manifesto of 1945 stipulated that the party believed "in Land Nationalisation and will work towards it, but as a first step the State and the local authorities must have wider and speedier powers to acquire land for public purposes wherever the public interest so requires". How else can we protect Belper from the greed and irresponsibility of the Tories, the developers and the land owners? 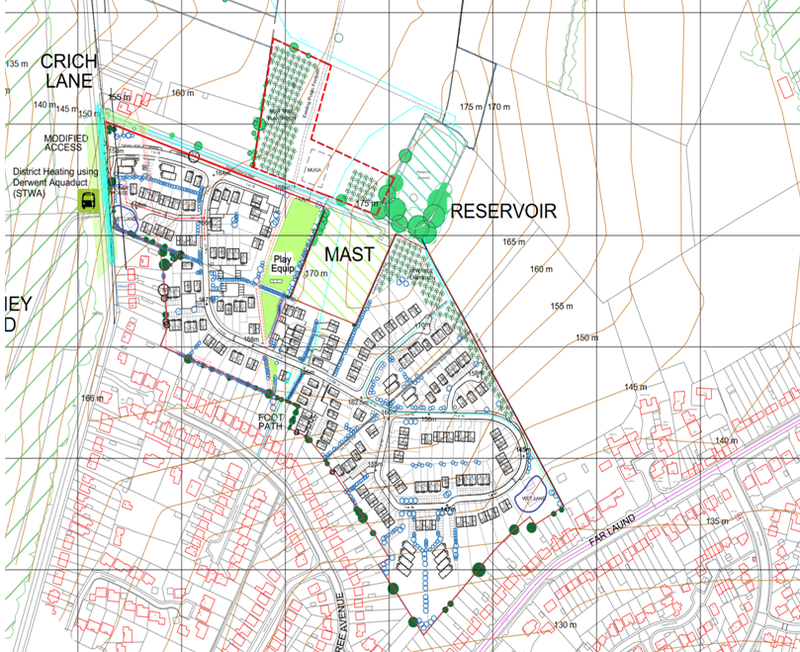 A planning application will appear later tonight, again for Bessalone Hill. That they should have the temerity to put in plans that abut to a world heritage site asset, Strutts covered reservoir, is amazing. Much of the site is WHS buffer zone. It is all green belt. It is vital that people object - even if they have done so before. As your Labour councillor for Belper North I will do all I can to fight this further attack on our town. I plan to host a public meeting to discuss again how to best object and to plan how we fight this scheme. We do need housing in Belper - and we need it to regenerate our Brownfield sites and our mills. ​It comes just nine months after a similar fiercely contested planning application for 201 houses on Bessalone Hill was withdrawn due to an error with the submission and it leaves residents and campaigners again facing more turmoil. 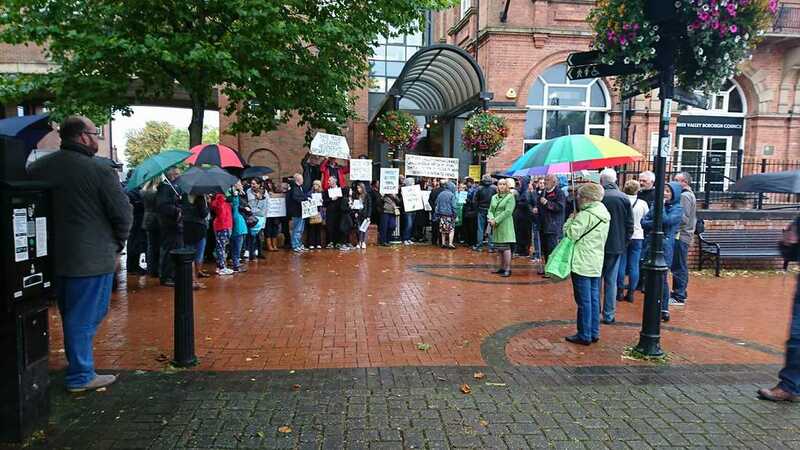 In June 2016, a cross-party group of councillors united to oppose the previous application. They held a joint meeting with concerned parties and over 60 people attended to discuss the application. Information on the new application, entitled AVA/2017/0322, has been sent out today to the surrounding area and local publications. More details can be found by typing the planning reference here. As with the previous application AVBC note that objections based on any of the following are not relevant or material planning considerations and will not be taken into consideration. A decision is anticipated by the 22nd of June, 2017. 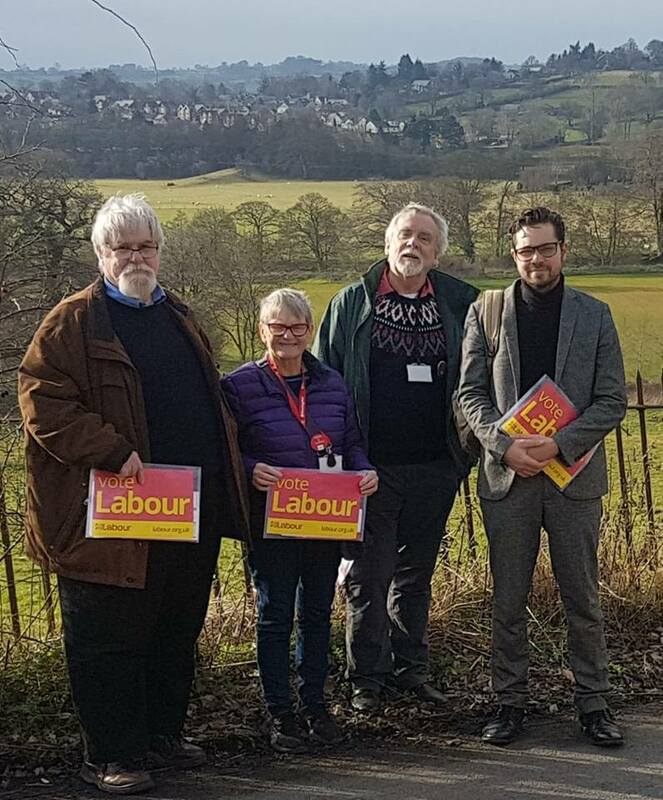 Belper's Labour councillors are fighting to get Bullsmoor and Belper Lane sites out of the local plan. Last night we tried to move a Labour amendment to remove these sites from the consultation. Here is what happened. Should the local Conservative party be taking donations from Directors of local developers? I asked the question at the full Council meeting - and they didn't like it and tried to stop me. ​At a special meeting of the Amber Valley Council on 6th March Belper's Hollie Webb MBE, hockey international and winner of an Olympic gold medal, will deservedly be awarded the title of Honorary Free Woman of the Borough. (As a member of the men's team which was slaughtered by a women's team some years ago I can testify to the skills of Belper Hockey Club's women players! ) This decision we are told supports the council priority of 'promoting health and leisure facilities to residents of the Borough'. It is a pity that the Tories have just decided to cut the funding of Belper Leisure Centre by £50,000 a year. Like most of their financial decisions, it doesn't add up. Belper High School is set to have its funding cut by 9%. Thats equivelent to 11 fewer teachers. Primary schools in Belper and the local area are to lose upto 13% funding. Our children deserve better. Click the link to see how your school is affected - and sign the petition! ANNUAL Fish and Chip Dinner and Quiz Night. This is a very popular event, where you can mop up a plate of fine food* from George’s Tradition and pool your knowledge (or complete lack of) with friendly team members. Cost including quiz entry: £7.50 fish and chips, £5 chip butty. Free mushy peas. And our usual RAFFLE: Donations welcome. CONSERVATIVES PROPOSE WORLD HERITAGE SITES FOR BUILDING. Labour councillors call for show of feelings at 1st March Meeting. 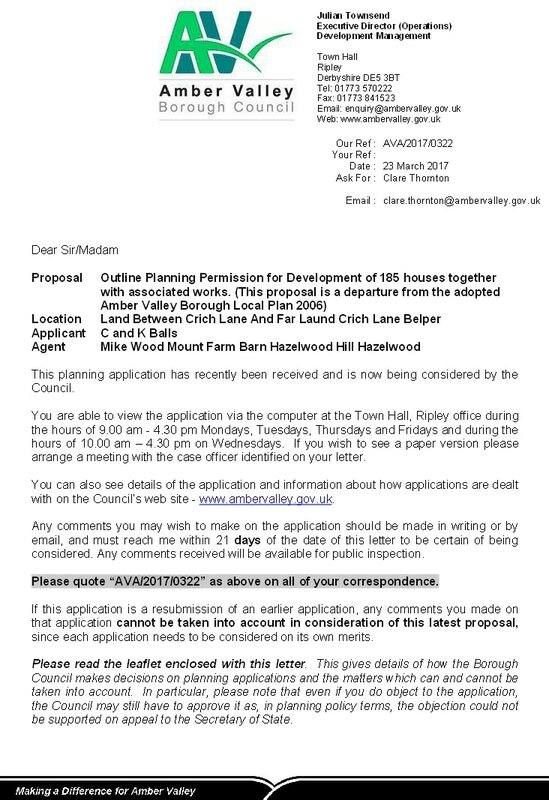 At the Amber Valley March 1st Meeting at Ripley Town Hall, the Conservatives are set to propose a new local plan, and shockingly, in a huge betrayal against the people of Belper, are proposing that World Heritage Buffer sites Bullsmoor and Belper Lane are included. Papers released today in preparation for the 1st March meeting reveal the appalling proposals, with maps of the planned sites being released. There are even proposals to delete green Belt and build on land between Kilburn lane in Belper, and the A38. 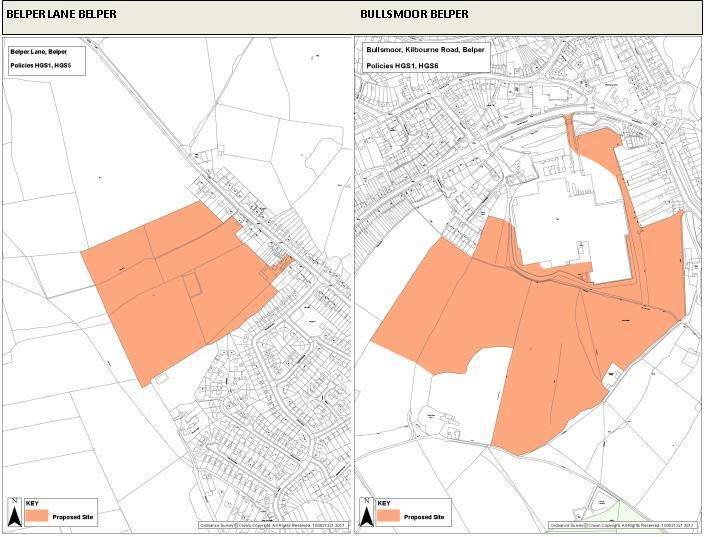 "Last year, Labour candidates Ben Bellamy and Maurice Neville stood for the Borough elections on a policy of protecting our green field sites and the World Heritage Site, and not only have they stuck by that, they have organised several large public meetings and made sure that concerns over Bullsmoor, Bessalone and Mount Pleasant are featured in the Belper Neighbourhood plan. They shared these meetings with local conservative councillors who at the time agreed with our opposition to these developments." Cllr Maurice Neville said “I fully support all the hard work over the years which the Protect Belper campaign has done to demolish the case for building on Bullsmoor. People will rightly be asking why sites such as the ABRU factory not in the plan instead? "Tory Councillors Joe Booth and Dan Booth both spoke at our public meetings, and led the public to believe that they were opposed to developments in the World Heritage Buffer Zone – how they vote on March the 1st will be crucial as to whether or not this plan goes forwards to consultation. Cllr Jackie Cox and Martin Tomlinson have been noticeable by their absence at any of these public meetings." 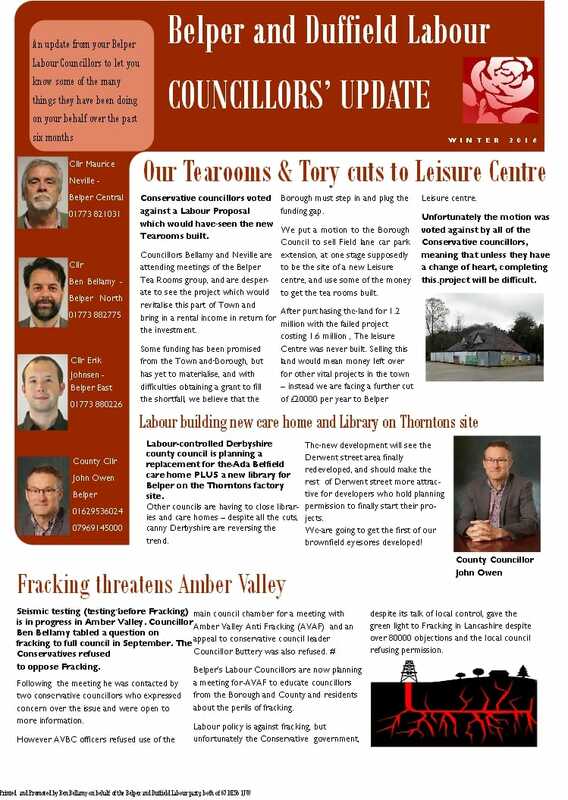 AMBER VALLEY CONSERVATIVES CLOSE OUR BELPER SERVICES BUT REFUSE TO PRESS THE GOVERNMENT FOR MORE SUPPORT FOR LOCAL HOSPITALS AND DOCTORS, BELPER SOCIAL CARE FOR CHILDREN THE ELDERLY AND INFIRM - OR EVEN THEIR OWN BUDGET. WHAT A USELESS SHOWER OF DO NOTHINGS ! 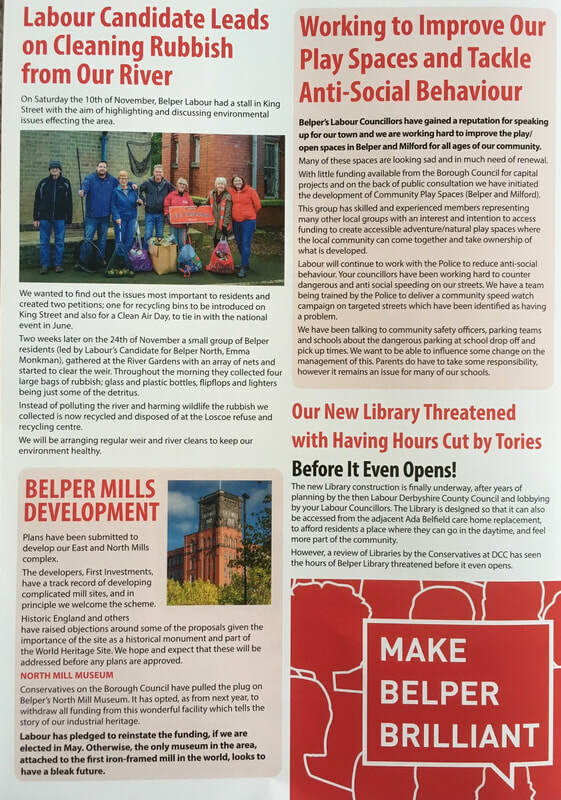 Planning application AVA/2017/0041 is fantastic news for Belper and shows what a the fantastic Labour Derbyshire county council does - We are building car homes and libraries, when across the country others are closing them down. THE INCOMPETENCE OF THE TORIES AT NATIONAL AND LOCAL LEVEL IS WORSE THAN EVER. THE 'NEW HOMES BONUS' WHICH SHOULD BE USED TO BUILD AFFORDABLE HOMES HAS BEEN USED BY AMBER VALLEY COUNCIL TO PLUG ITS BUDGET GAP INSTEAD. Now central government has filched £240 MILLION of this funding as a sticking plaster for the £1.9 Billion Social Services funding crisis. For the whole country, including Amber Valley, this means even more pressure on borough council budgets. Its called robbing Peter to pay Paul - the economics of idiocy. I am delighted that our lobbying has finally seen the Town Council do the right thing. A couple of years ago we had to raise a petition to prevent them giving this money away as an election tax reduction sweetener. Belper people will also be aware that the five conservative borough Councillors, some who also sit on Town council voted against Labours pre Xmas motion to fully fund the project. We proposed that this was achieved by selling the field lane land, purchased for £1.6 million for a leisure center that never was and using just some of the money to see the project realised. Clearly there is still a huge shortfall, and Belper's Conservative Borough Councillors have questions to answer from the electorate as to why they refused a sensible solution which would have seen spades hitting the ground,and where they think the rest of the money is coming from. Belper Schools are due to have funding reduced up to £415 per pupil per year. See below for how badly your child’s education is being hit by the Conservatives. England’s schools are now experiencing the largest real terms cuts in funding in more than a generation. In real terms, schools will lose huge amounts of money rising to £2.5 billion a year by 2020. 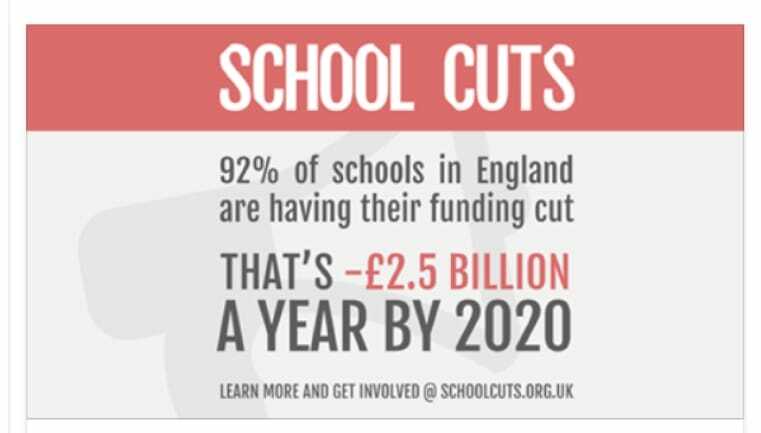 92% of schools will have their funding cut. The Labour Party will PROTECT THE ENTIRE EDUCATION BUDGET and reduce class sizes. 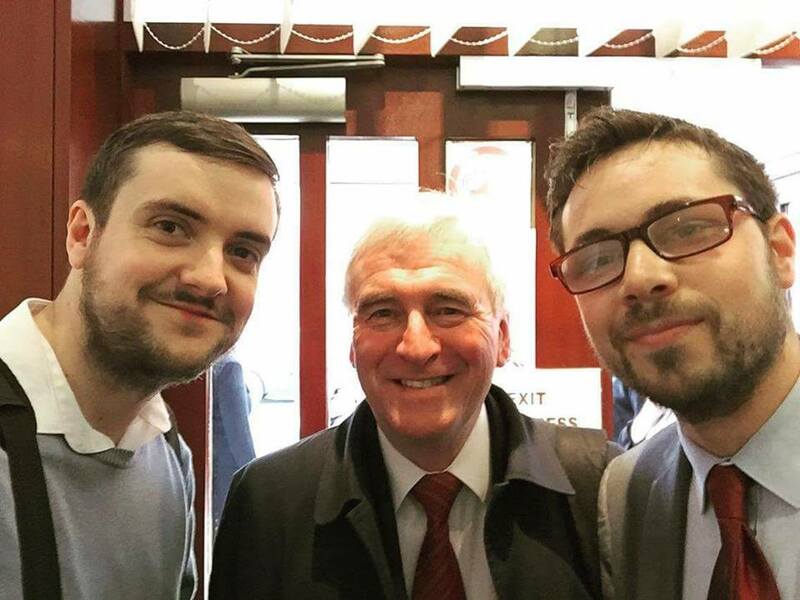 If your children go on to higher education they will benefit from abolished tuition fees and restored maintenance grants, so that they do not build up a mountain of debt at the start of thier lives. Education will be funded progressively – by taxing corporations and the highest earners, not those who can least afford it.Tory cuts in Corporation Tax are now showing for what they really are – cuts to our children’s future. We must invest in education if all young people are to have the chance to succeed. We’ll ensure the whole budget - including early years, schools and post-16 education and skills - is protected. : The estimated reduction in the school's annual budget by 2020 in real terms, under current Government policies. These include plans to reallocate school budgets according to a new national funding formula, and not increasing funding per pupil in line with inflation. Find out more about our calculations. : Amount that would be lost for every pupil at the school as a result of the reduced budget. : Based on an average teaching assistant's salary of £18,000. Amber Valley residents have been invited to join local NHS leaders to discuss the future shape of health services in the area, at a public meeting on Thursday 15 December at 2pm at Belper Town Football Club, Christchurch Meadow, Bridge Street, Belper. Derbyshire Community Health Services NHS Foundation Trust is hosting the one-off public meeting for all to join in the discussion. It will be a chance for people to air views about the recently published Derbyshire Sustainability and Transformation Plan, Joined Up Care Derbyshire, which sets out a five year vision for the way health and social care services can be integrated across the county. As well as an opportunity for sharing views and ideas about NHS and social care provision, there will also be a presentation from Ifti Majid who is one of the leaders most closely involved in taking forward the 72 page Derbyshire Sustainability and Transformation Plan (STP), which was published on 18 November. The Trust has made steps to engage with the public as part of the consultation, but the timing of the meeting has been criticised for taking place when many residents are at work. There also seems to be some uncertainty over the timescale and level of public engagement. The publication of the Derbyshire Sustainability and Transformation Plan follows close working by all health and social care organisations in Derbyshire to examine how care can be as efficient and effective as possible for patients over the next five years. The plan, outlining local priorities for Derbyshire, was submitted to NHS England in October, as well as plans covering every other area of England. The Derbyshire plan was the first to be published in the East Midlands on 18 November 2016. The Prime Minister and Chancellor completely ignored the urgent pleas from Tory and Labour MPs and virtually all NHS and Local Government organisations for more funding in the Autumn Statement. 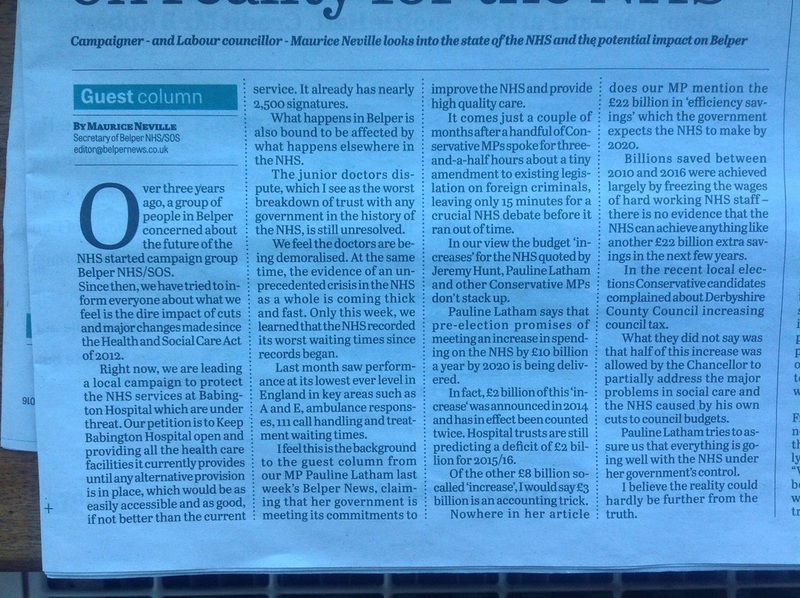 Our local MP Pauline Latham has repeatedly called local NHS campaigners ‘scaremongers’ and made no attempt whatsoever to protect Belper from the cuts to the NHS and Social Services imposed by her government. All we are getting is a plan for more cuts, hatched in secret, and promoted by NHS officials who have been bullied into co-operation by threats to deny access to funding. Campaigning is now finished - its over to the people of Belper to decide. 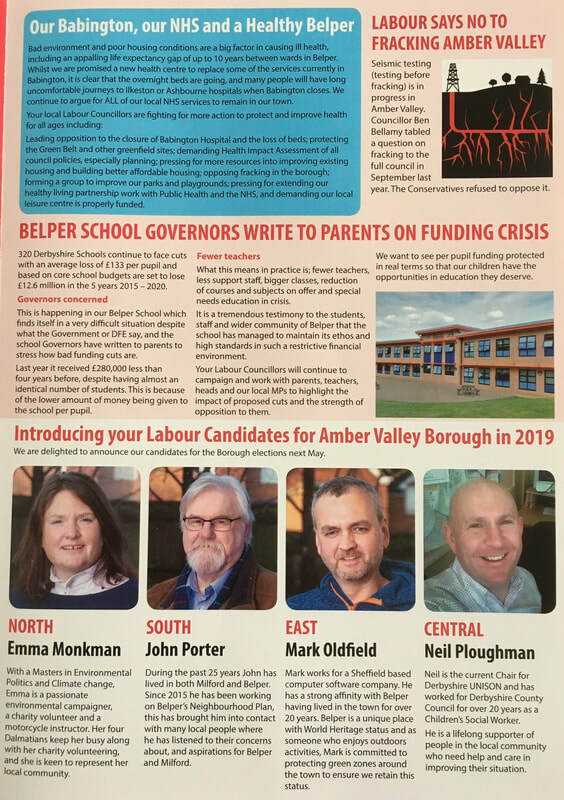 We have met so many people in the two wards and had so many discussions about the future of Belper - whatever happens we are very proud to have been Labour's candidates and feel lucky to have been working with the fantastic campaign team. 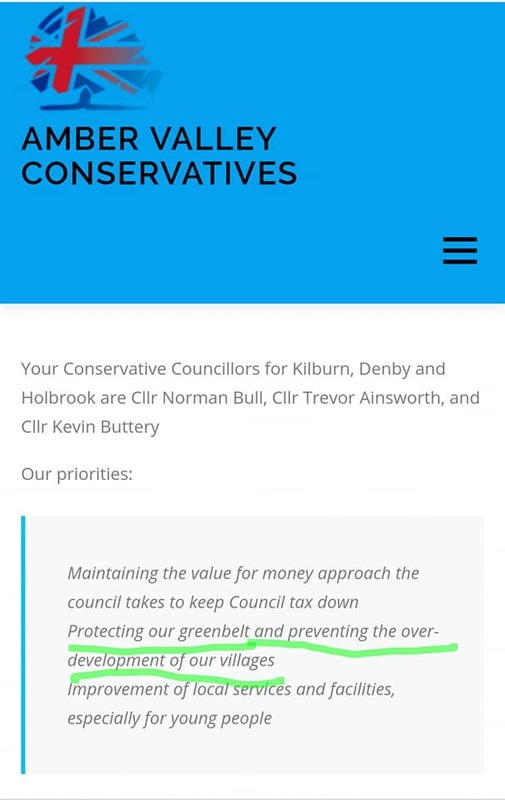 Quite sad to see poor Councillor Hillier desperately pretending to be happy about the 'achievement' of Belper's Conservative Borough Councillors in 'preserving' 2 security cameras. All the Town Councillors voted against the cut in cameras last month - except the ones like Hillier and the Booths who are also Borough Councillors. The decision about which two cameras would remain was made by officers and had nothing to do with councillor Hillier and his friends. Councillor Hillier is so embarrassed he has been forced to spout utter nonsense. Not content with this Councillor Hillier also felt moved to write a long letter in support of serial liar and racist, misogynist bigot Donald Trump ! This includes hoping that Trump's policies work for the US. Some elements of the Conservative Party were fans of Hitler in the 1930s. 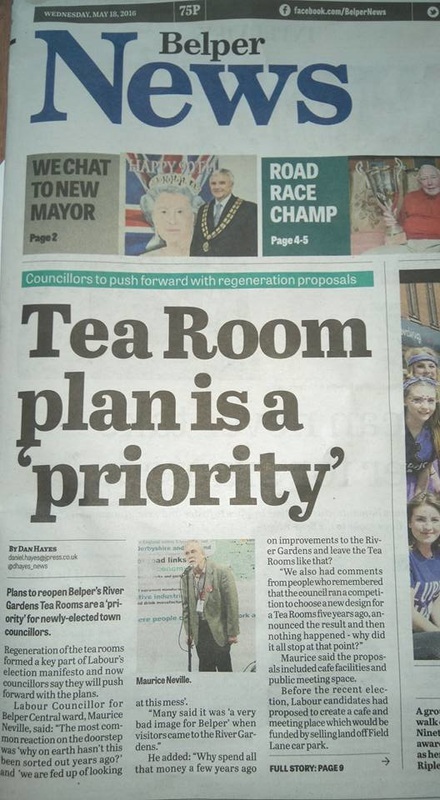 The Conservatives may have held onto the borough by sixteen votes in Ironville, but Cllr Neville and myself will still be pushing them to properly fund the tea rooms. Come on Belper - if you haven't done so yet, buy a brick for the Tearooms - the more bricks we buy as a community, the more it shows how much we need this. Another 160 bricks to hit the 10k target! The estimated cost is c£450000 . The building has been deemed uneconomic to repair, and so must be rebuilt anew. There are certain constraints, from a heritage point of view from English Heritage and the World Heritage Site, and also the Enviroment Agency (it patently needs to be flood prooof etc). It also needs to be large enough to be able to run as a viable business, so that it does not fail. Of course - the big plus point is that it will bring valuable rental income into the borough council - turning capital investment money into income; and will begin to rejuvinate heritage aspect of the town, bringing tourists in who will bring more vital income into the local economy. Richard Cusack recently interviewed Labour Councillor Ben Bellamy at Belper Lane, about applications to build in our World Heritage Site buffer zone. We’ve done it! Last night, at Belper Town Council meeting, we presented the petition against setting a zero precept. Tory controlled Belper Town council voted AGAINST Conservative veterans Councillors Alan and Jackie Cox and their own finance committee’s recommendation to set a zero precept – and enough of them voted WITH the Labour group’s proposal to keep the precept as it was. 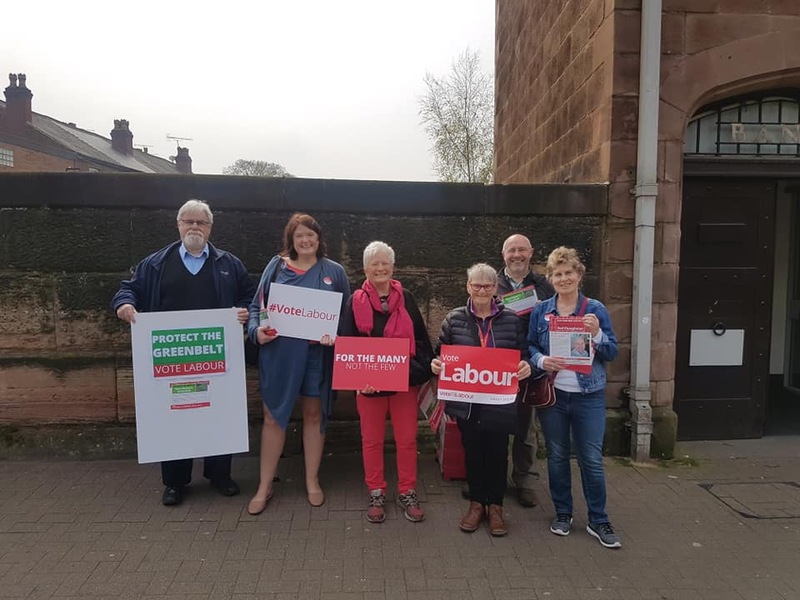 The conservatives in the Town are clearly not of one voice – but several of them are to be commended for crumpling under the pressure of our petition, and of several eloquent members of the public who spoke against the proposal at the start of the meeting. Clearly a bizarre statement, especially as grant applications later on in the meeting were not all fulfilled to the levels requested. And, to their credit, the council give some funding to several important community projects in the Town. Why not – what if, say, a scout group had £100k and needed a further £10k to build a community centre and scout hut? Would THAT not be a good use of money? So that’s why whilst the borough council was Tory controlled, it spent £1,634,691 buying what ended up as a car park extension for field lane. And actually, there is a Business Grants committee – so they could help fund improvements if they chose to. What we need is a proper consultation with the people of Belper on how to spend the reserves, and they need to be spent wisely for the community. And if you vote in a Labour Town Council in May then that is exactly what you will get. Don't cancel the 2015 precept worth average 50p per week - the £350000 reserves need spending on things for the benefit of the people of Belper, such as community centers, the river gardens, keeping toilets open, young peoples groups etc. On the 20th January, Belper Town council proposes to cut the local council tax by the price of a bag of crisps a week, for just one year, thus using up nearly a quarter of million pounds that could be go so far to building permanent and lasting facilities for the town. · Why is there no plan, investment strategy, annual review, risk assessment, or any other organised information about this reserve readily accessible on the council website, as is clearly available on many other small town council websites? Do such essential documents even exist and were these matters ever addressed by the Conservative Councillors? · Minutes of a Belper Town Council meeting in February 2014 state that ‘the Committee agreed to spend the council reserves by the end of March 2015.’ Firstly, no responsible council ever tries to manage on zero reserves. Secondly, hardly any reserves have actually been spent by the Council this financial year. Meanwhile hard working local groups and charities are left in need of support and the Town’s public facilities badly need investment. There has never been a proper public consultation or adequate discussion about how this money should be managed. Only two Conservative members on the financial subcommittee of the council (which has six members ) ,husband and wife team Councillors Alan Cox and Jackie Cox , met on December 18th and the results of their deliberations on the budget and reserves will be discussed at full council – open to the public – at St Johns Chapel at 7pm on 20th January. 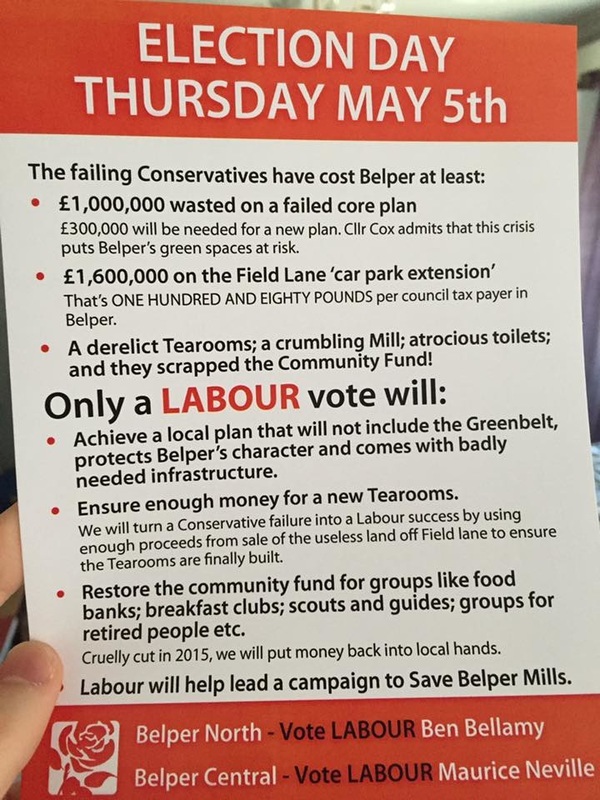 After nine years of salting away tens of thousands every year, in a last minute move that smacks of panic, Conservatives are proposing to reduce the Belper Town Council Precept, an average of less than fifty pence a week to Belper residents, to zero for the next financial year. In other words, instead of using the money constructively, fritter away about £240,000, two thirds of the reserve, to pay for normal council expenses next year. 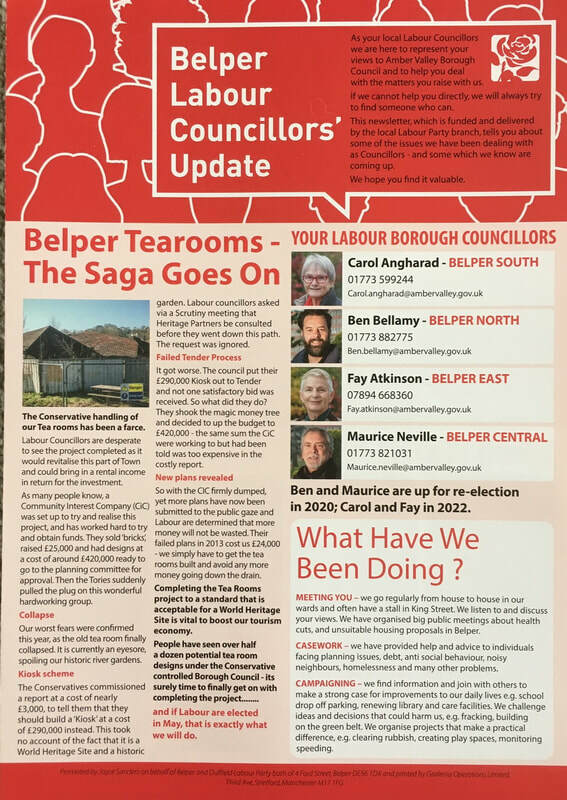 As cuts are reducing all public services and central government support for councils is also cut it is even more important that Belper Town Council uses its resources wisely. The Council supports a number of facilities, groups and activities, which is to its credit. But why abandon the chance to do much more to make Belper a better place? Why propose an irresponsible election year give away, which has not been discussed with residents and is not even part of a proper financial strategy? We need a careful process of consultation with Belper residents about how best to use next year’s town council charge and the considerable asset to the town of such a substantial reserve, which is much more than a full year Council budget. The current Conservative led Council has not addressed its responsibilities in the management of its reserve responsibly, openly or in a timely manner. The meeting on 20th January must not be allowed to rush through irresponsible decisions about such substantial public funding. The national spotlight was again turned on The Great British High Street winner, Belper, on Thursday 15 January, when High Street Minister, Penny Mordaunt came to town. The Minister’s visit followed a recent ceremony at Westminster, when representatives from Belper were officially presented with the prestigious awards as both Best Market Town and Best High Street in the UK. During Thursday’s visit Penny Mourdant was guided around some of the Town’s winning projects by members of the Belper Vision Group. She was introduced to local retailers, many of whom participate in the Totally Local scheme and Belper Ambassadors project. She also took the opportunity to see the Belper Mosaic Railway Project – due to be installed at the town’s railway station in the spring. Labour controlled Derbyshire County Council held a public consultation on proposals to develop the former Thornton's site in Belper. The proposals is for an extra care facility for the elderly and a brand new library.The reaction from residents who attended was very positive. An outline planning application will be submitted to the Borough Council next month. Labour stalwart Patrick Mountain is one again the party’s candidate for this seat. Whose ,knows, with UKIP standing this could be Patrick’s year. ErikErik Johnsen of Milers Way Milford is the local Labour candidate for this seat. Erik ,a Town Councillor, has previously been a Labour candidate in this seat. Tory Leader Stuart Bradford admitted at the latest Council meeting that the details of the purchase of the Field lane was only reported in the public section of the Council papers because of a Freedom of Information request . They now want to sell the land but have refused a Labour request fora report to comeback to Full Council for approval of the conditions of any sale. 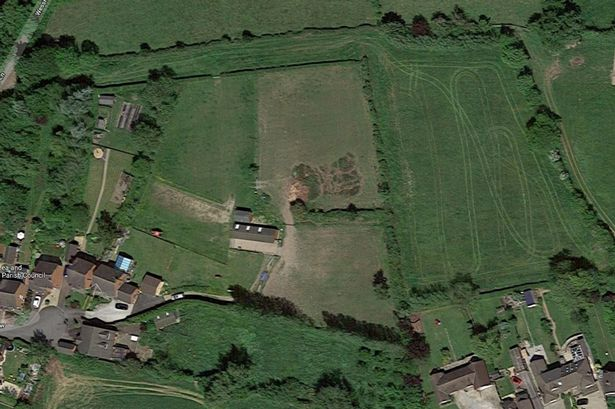 1.1 To seek approval to dispose of land at Field Lane, Belper, as illustrated at Appendix 1. 2.1 That the Executive Director (Operations), in consultation with the Leader of the Council, be authorised to dispose of the land at Field Lane, Belper on such terms as he considers appropriate. 3.1 The Council has insufficient capital or revenue resources to finance new leisure facilities on land at Field Lane, Belper. 3.2 Sport England has recently completed a high level review of sports facility requirements across Derbyshire utilising its Facility Planning Model. This does not support the design and facility mix of the proposed new leisure centre on Field Lane. 3.3 The disposal of the land will generate a significant capital receipt for the Council. 3.4 Development of the site for retail purposes, particularly with high street names, would be a benefit to the current town centre retail offer. 6.1 At the meeting of Full Council on 2 November 2011, consideration was given to reports on a feasibility study for new leisure facilities on land at Field Lane, Belper. 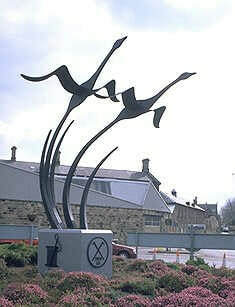 It was resolved that the Chief Executive, in consultation with Belper members, be authorised to proceed as set out in a confidential appendix (Minute 3402 refers).Consequently, the Council purchased land at Field Lane directly from the landowners and entered into an election agreement with a developer allowing the Council to elect to activate a development agreement to develop new leisure facilities on the site for a three-year period. The three-year period expires 28 November 2014. 6.2 The purchase price for the property, including stamp duty and legal fees, was £1,194,720. In accordance with the election agreement, the Council also paid the developer’s ‘finders fee’ of £56,800, professional fees in respect of proposed leisure facilities of £166,010 and 25% of the gross development profit on the guaranteed maximum construction price of the proposed leisure facilities, which equated to £217,160. These elements were paid in installments by 30 January 2012. The total cost to the Council has been £1,634,691. 6.3 Since the decision in November 2011, the Council has been unable to generate sufficient capital receipts from the sale of surplus assets to fund the proposed development. Officers would also be unable to recommend the use of the Council’s prudential borrowing powers for that purpose because of the resultant unsustainable demand of the repayments on already restricted revenue budgets. 6.4 Sport England has recently completed a detailed ‘spatial review’ of sports facility requirements across Derbyshire utilising its Facility Planning Model. This compares current facility provision and usage with projected changes in demand as a result of population growth up to 2028 (to align with and evidence the Core Strategy planning documents). 6.5 Sport England’s modelling has clearly identified that, given recent developments on school sites, there is no strategic justification for any further sports hall provision in the Belper area. There is a forecasted shortfall of available swimming pool ‘water space’ by 2028 but this will be fully satisfied if the proposed new facility (which has planning approval) is realised at Ecclesbourne School, Duffield. 6.6 Given Sport England’s Facility Planning Model evidence base, it is very unlikely that significant external grants will be available to support a new leisure centre in Belper as currently proposed. 6.7 The developer has maintained contact and confirmed its continued interest in working with the Council. It understands that in the current circumstances, the development of the site for a wholly leisure use is unlikely to take place and has therefore been investigating other development options, primarily for retail uses. The investigations have confirmed interest from high street retailers that would be a benefit to the current town centre retail offer. 6.8 The developer would like to agree terms with the Council for a Subject to Planning deal covering the site and appropriate rights over the adjacent car parking at a price to be finally determined once Heads of Terms with any tenant are agreed. Authority is therefore sought for the Executive Director (Operations), in consultation with the Leader of the Council, to dispose of the land on such terms as he considers appropriate. 6.9 An independent valuation of the land will be obtained in advance of the negotiations. The sequence of events which has led to the current situation is as follows: For the last several months there has been a dispute between certain Conservative councillors and members of the Council’s staff. This bad feeling led to a member of the Council making what were considered by other councillors to be unprofessional and inappropriate remarks to one of the Council’s employees. Although the councillor in question did later apologize for the remarks it was still felt by the majority of the Council that the situation should be referred to the Staff Working party, (the committee of the Council responsible for dealing with human resources related issues), to decide the most appropriate course of action. Unfortunately the Mayor, in her capacity as a member of the Staff working party, refused to allow the matter to be discussed. In the opinion of the Mayor the apology was the end of the matter and thus the staff member was left without a right of reply. The Situation came to a head when the Mayor, reading from a pre prepared statement, criticised a member of the Council’s staff in an open meeting. The Mayor appeared to imply that the staff member was biased against certain community groups and had behaved inappropriately when dealing with complaints from members of the public. Whatever the circumstances, and irrespective of whether the criticisms had or have any basis in fact, the remarks were inappropriate. As with any other employer the Council has a duty of care to treat its staff fairly; making unproven accusations in public against an employee is unacceptable. 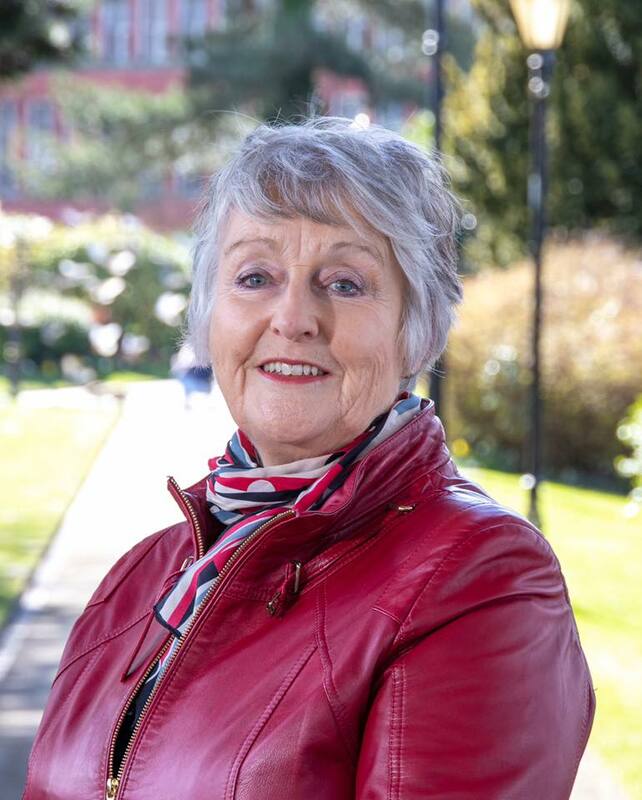 After reading from her statement the Mayor adjourned the meeting stating that the meeting had become unruly, leaving her fellow councillors with no chance to respond to her actions. It was this incident, and the Mayor’s subsequent refusal to apologize for her actions, which finally convinced the Council that the Mayor’s position had become untenable. The Mayor has now lost the confidence in the vast majority of Belper Town Council. 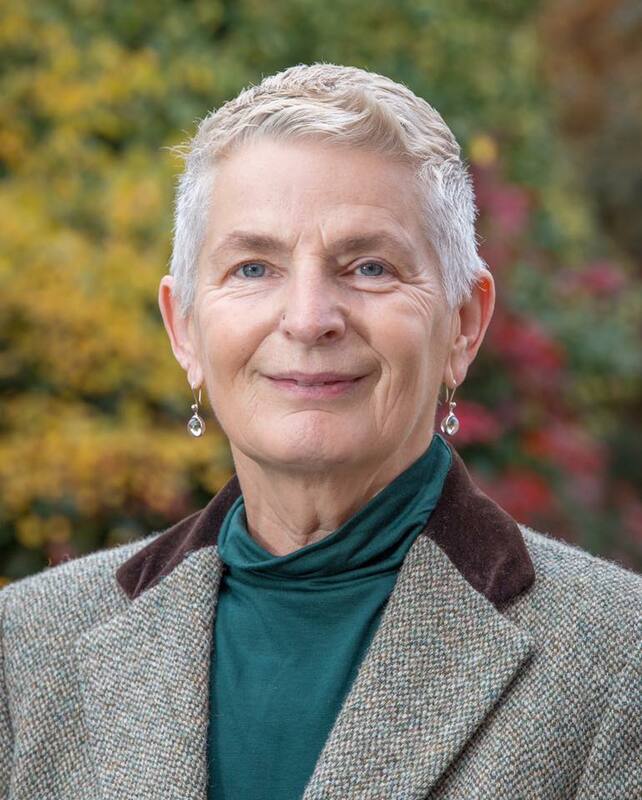 Despite losing a vote of no confidence the Mayor has refused to resign her position and the majority of the Council refuses to attend meetings while she is in the chair. This deadlock has led to the unprecedented formation of a ‘general purpose committee’ which is able to perform most of the duties of the Council without the direct input of the Mayor.